« Durood-E- Khizri (ﺩﺭﻭﺩ ﺧﻀﺮﯼ) : Sallallaho alaa hbeebihi Muhammadinv wa Aalihi wa ashaabihi wa sallam. Again i got the same mail asking people to take action against a bar with name Mecca Bar or Kaaba bar. I dont know from where these rumors are generated and who are the people behind these kind of rumors. In reality the pics shown above are picture taken during the construction of the building. Actually this building belongs to Apple and is in fact Apple Store at Fifth Ave. New York City. You can see more picture of this building at Apple site. You can read another similar post here. 1. Nov 2, 2009 10:05 AM: Added Line “You can read another similar post here.”. 193 responses to this post. send me truth against this story…….its a huge confusion. Thanks Alot brother.. Now our confusion is finished about Makkah Bar..
ameen. before.doing anything plz verify it properly. The Apple is a big Company he can give the name like AppleBar but y they have given name kabba bar .They should has to give english name . and one thing more i wanna share.. recently i got an email, that Aldo shoes have launched a new collection with the name of Fatima and abdullah for women and men respectively.. but that was also a rumor.. there is no such thing. i’ve visted there website.. there is no Abdullah and fitima range! and i don’t know these freaks spread rumors like this!! But bro… a well known company also made the shoe on which the name ALLAH (Naozobillah)… is written… so what do you say about it….. Notorious and mischievous people from kufaar and mushrakeen did all sorts of things in the days of the prophet when he was alive to annoy Muslims and to see his reaction, but he never retaliated or harmed anyone of them or said anything bad about them. This was to set an example to the rest of Muslims to be patient. We should follow the example set by our beloved prophet and show patience. These stunts will die with the passage of time. Follow what our prophet did and not what the Mullah says to you. As for the company that made the shoes, this could also be wrong. Why would a company that sells shoes would do that? To annoy Muslims? Doesn’t make any business sense to me. Anyone with a decent enough graphics software can make thing look real on a computer screen. Dont believe what you read on your computer screen. Do your own research before coming to conclusions..
Can u pls tell me the name of that company and their website add.ans also can u send me link for that shoes. . This is an Apple store, not shoe store. thank u 4 allowing people 2 know that this rumor is not true but it would be great if u cud send this info 2 every1 so they can live at peace as well as the people who already know that this rumor is not true. P.S it wud be great help! Thanks for sharing this info. after a long time since its first appearance this rumor is surfacing again. I did a research to find out exactly and this article has helped me correct my friends. Thanks a lot for your information sharing. Thanks for providing right information. I am sure govt. also won’t allow such names for any businesses as in most countries names of holy places and gods are not allowed to be used as business names and trademarks. However, its america and anything is possible there, but still im happy that this is not true. y its name is kaba bar if this is just a rumor. Ok brother wat ur telling is true n I agree with u.but im angry on the name mecca bar is that name true.is this is the name given to bar.and if this name is given then we have to fight to clear that name.thanks for ur info brother. Yes sister I totally agree with ur words.if this is only rumors then y there is still bar called mecca bar.is this is only a rumor. Salam ! Thanks for providing the right information. These days, Attempts against our Religion are so Frequent that it’s hard to understand whats right and whats wrong. After seeing so many people talk Dirty against Islam, people assume such things as the Truth. Now come to think of it, I don’t Blame them either. I cannot believe how fast the rumors spreads. It is very wrong for us to not research something so serious like this and start informing our Muslim community. I have been to this store. It’s an Apple store. Apple sells Macs, and they fix Macs at the Genius Bar. Therefore that’s where the so called Mecca Bar was derived from. Someone said that “after seeing so many people talk dirty against Islam, people assume such things as the truth.” – I think it is our duty to find the truth before spreading it. We (the Muslims) are all very smart and Alhumdullilah very blessed people, therefore, it is my request to everyone to please taking the initiative to spread the right word. Do not listen to just anyone. This makes us look very bad all over the world. So please, pay more attention and research before you actually believe in something. Thanks a lot for this article. Appreciate it! hnx for clarification, u realy have been to this store. It’s an Apple store. Apple sells Macs, and they fix Macs at the Genius Bar. Therefore that’s where the so called Mecca Bar was derived from. Thanks a lot for this article. Appreciate it!These days, Attempts against our Religion are so Frequent that it’s hard to understand whats right and whats wrong. Assalamualikum warahmatullahi barakatuhu………Well done my brother…you have done a great job by revealing the truth behind all this………. A simple order of God was TAHQEEQ and another was FIKR. One means to research and the other means to think deeply. We neither do the first nor the second and begin to follow whatever right or wrong, true or false is being shown or said to us. Dear brothers and sisters please verify each information and think deeply sometimes our own senses perceive things wrongly so before spreading it please please be careful. Thank you so much for clarifying this misconception…! Thank you very very much for letting us know that this is a rumor. Alhamdullillah. I got really mad after I got the mail today for a petition to vote against the Kaaba bar. Astahfilullah. May Allah bless you and all muslims. Thankx a ton. . .
May Allah shower blessings upon you!!! I wish there were people like you who are willing to know the truth and the reality behind the rumors and educating the rest! Thanks for this informative and mind clearing post. from the kind of e-mail reading/forwarding Muslims are at receiving end, wasting valuable time in unnecessary topic and enemies of Islam get happy. Beside sending such SMS with request to forward cell phone companies getting more business – got it? Its a cheap business tactics. I ws really mad when i got this mail. But I first decided to check its legimatecy. So i searched on google n many more sites n came to know about the truth. I also advise my muslim bro n sis to frst confirm the truthness about any rumour because it is easy to fall pray to such rumours…. asalam u alaikum thanx bro and i fowrd to my friends ok jazakallha naretakbir allha huwakber. JazakALLAH for sharing & enlighting us with this information. May ALLAH bestow his mercies on all our muslim brothers & sisters. 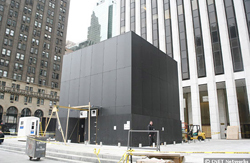 I recently got the information about the construction of the kaaba/mecca bar of New York.One of my friend said that its structure is just like khana kaaba in saudi arabia and its for the people who want to go in the night club and its just like a night club and i cant believe in it but when i saw it on ur website i saw that its just like kaaba.plz inform me that what is the matter. Please read the post completely, its not a night club and not a bar. its essential to send this pics to all that persons which have some doubt about this pic. its great that its just a apple store.me relax now..
my request to all muslim read and find the reality before u tell some other muslim brother about this……. so take care if u receive any mail or messages saying wrong things about islam…..
and i will send a back msg to my frnd, to stop sending this message to other muslim without knowing the truth……..
and thats not all, when i read this message i was very much angry and i started to check ‘how can i contact to mr. obama……..
Askm, Yes indeed we should checkek the truth. As Muslim, we should speak and spread the truth nothing but the truth. We have enough Islam bashing around and we must always be patient and not to get angry easily about something appeared to be “provokative” . Spread the truth about what Islam is all about. Thank you brother, I usually do little thinking before forwarding any email, but this time asstaghforlah I fail. Then soon a brother sent me this info and alhamdolellah I sent it to all the ones I had sent the previous one. May Allah Guide us all and give A’ffyate to those minds who initiate these rumors!! We Muslims simply must stop being so paranoid. The entire Western world is NOT out to destroy our faith or way of life. Yes, there are blasphemers and critics, but like terrorists who justify their barbaric acts in the name of Islam, our enemies are a very tiny minority. AOA…… i got an sms from a friend…i got mad,but before doing anything i tried to verify it.Thanks bro its clear now.. Thank u…..done a grade job.I receive this mesg and decied to verify but momment i found the thruth i wound how fast these romures spead..Everyone need to verify these isjam related mesgs before forward. GREAT! i was so mad at first ! :@ people are so stupid at times ! Thanks alot for the valuable insight & information. Jzakallahkhair Brother. that’s such a great point you’ve cleared… kudos.. Thanks alot for verifying these pics, May Allah guide all mankind & save us from hatred amongst each other. Thanks very much for providing the information correctly cos on face book there are sum ppl who are mis leading the viewers by making sum groups saying stop kabba bars but after referring to his site even i clearly know what exactly it is. I have just noticed that there are about 0.2 million users on Causes.com debating about this hoax. I don’t know why people are getting senseless and following such messages. May Allah show them the right path. There is no true thing that we can say this Building similer to Kabba. This is just a transparent building. Please use your mind always. thanks for the clarification brother..???? thanks for the information..i will prays for ur website…. Thanks for such a relevant information about this concern, once i was discussing about the same issue from my uncle, so he asked me that have u ever searched about this. He said its just a rumor nothing else, and now when i searched i got your web link which help me a lot. So nice of you guys. i was @ a occation when i heard this rumour. I was shocked and suprised when i heard. Imagine the name of holy house used for bussiness..of a bar for drinks which is total harram But alhamdulillahi am very happy when i found out that it was just a rumour…..
“jAZAA KUMU LAHU” to you all for letting us know the fact. (ariks). Maasha Allah. Jazakallah. Thanks for clarification. Salam alaikum. I read your explanations and defence. I even thought the owner should be convicted according to Islamic jurisprudence.However, that name should be change to something else. Kaaba is a revered and sacred name and how dare could anybody, for any reason, attribute bar to it.That name should be changed if that company does not want to incur the wrath of Allah. all friends pray for god for all. B+ve always. obay$controlling this is must for all. Thank you so much for your clarification. I believed the rumor when i first read it in a respected newspaper. thank u 4 allowing people 2 know that this rumor is not true but it would be great if u could send this information to every1 so they can live at peace as well as the people who already know that this rumor is not true…..
Al-humdu-lillah, i would like to do that, but how I could do it alone? So I request all the visitor to spread this news to every one they know. Jazaakallah. allahuakbar…. the god is great…!!! My hert was in sea.but after reading ur posts and finding new images in my mind there moved some misunderstanding.but here is some more question that then wat is ka’aba bar.pls give detils abov it. thank u for give knowledge…..
shukriya bhai sachchayi bata ne ke liye allah aap ko aur aap ke ghar walo salamat rakhe…………. we should do some thing for that. Thanks for the clarification. I was really furious! Thanks Bro… I also come know to know this today itself…. It appears to me that this website doesnt load up in a Motorola Droid. Are other folks getting the exact same issue? I like this web site and dont want to have to skip it whenever Im away from my computer. dosto ye sab jo kuch bhi ho raha h isme eemaanwalo ka bara imtehan h isme kamiyab hone k liye quran o sunnat per mazbuti se amal karne Ki zarurat h.
Jazakallahu khairan!unfortunately,i was also misled and i misled some muslims my self!i have to correct this error! Toh اللَّهُ knws wot dis ple r up to! Trying bring fite among demself! Is indeed very important to clearify conflicting images like this,May Allah s.w.a guide and protect us all through the right path,Ameen! Pls send me true story. B/c I received zis msge from a frnd and we are all sad abt it so, if you send me I can share it among our frnds. Jazak Allah khairan!!! Even me I receieved such emails on BBM and I even forward it to my friends thanks for the update….May Allah(swt) protect and guide us Ameen! I got this mail too,but I verified before reacting,so thank you and let us try to help this umaah not to beleave everything they read!we have a lot of trouble causes out there,as muslims we have been warned of this time that we in!so keep up the good work! I am calling on people to stop spreading these kind of rumors in order to avoid confusion and religions crisis. May God save us all from the evil acts. Salam,may Allah reward abundantly ameeeen!!! Allah maaf farmaey humain aur humari kafrun k muqablay men madad farmye. Thank you very much brother for helping us.Allah blessed u.
thanx bro…. Those who did this rumer…. May allah will punish them…. Inshallah rahman…. Reblogged this on I am doing My bit.Are you?. Hey bro send me also truth gainst this story..
was that necessary to keep the name of a bar as kaaba/mecca bar?? Whats this?this is a well planned mission of american kafir to hurt the hearts of islamic world. People who don’t understand the story even after reading it, this article says that Kaaba bar is not true, Actually it’s Apple store (electronics store). what is the name of this place.if that is kaba bar then we will destroy your bar.why they made it like holly kaba.it is big insult to HOLLY ISLAM.some people wrote in their comments (thanks to inform us dear bro) how can u tell to someone who insulted to u r HOLLY MAKAH. if it is rumour then why its name is kaaba bar??????????. if it is a simple apple bar then why we are finding it with this name. please inform the people with authentic and accurate news. Why they call Kabba plz give replay??? i dont know its romour or truth BUT if it is true then AMERICAN are INVITING PUNISHMENT OVER THEMSELVES. ALLAH sb sy bara h…aur ALLAH nain in kafrou ko kholy aam ijazet de h..ye kuch b kary.in hisaab aakhrat main ho ga…..in k iss tara krny sy na tou islam ko koi fark perta h aur na kabi pary ga…..ku k islam zinda hota h hr karbala k baad….. It is a huge sin.God will destroy who do this work.God does not forsake those dont respect hi prophet.